Is it just Egyptians who are in Tahrir Square? The world is on stand by in Tahrir Square. Yesterday came what the Prime Minister called a �Bloody Night�. Five people were killed during protest. A doctor on the streets stated he had treated thousands of injuries. Who put the weight of the world on your shoulders, Tahrir Square? With a population of over 80 million, Egypt�s �face-less� demonstrations take on anther day. Across the world, the sole mention of the world Arab world brings everybody back to Egypt crisis. Protesters and supporters of the Mubarak government, and those of the fire, these are the images around the world. The military and their tanks and the world continues on stand by. Demonstrators insist for the regime to stand down. News channels for days have been screening the same square. The world itself is looking into Tahrir. Any business which refers to the Arab World, such as oil, has been disrupted. 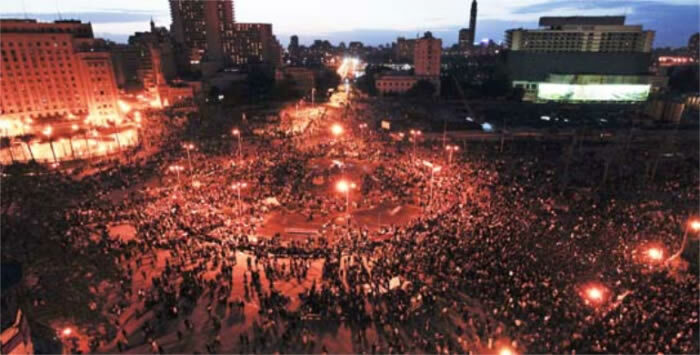 In some way people around the world have a feeling of connection, they too are on stand by, waiting in Tahrir Square. So now everybody is there. The Suez canal, the supplies brought in, the journalists entrenched and the military on stand by. As Cair and Alexandria put the world on stand by, the world stands by Egypt. Stock markets shift and rise, Yemen Prime Minister issues statements, Jordan voices reach the crowd, the images of the President of the United States are screened on the square, and �flanked� by Ban ki Moon, Cameron makes his statement. The International community condemns violence, in any form. But what have we, the media, and the outside people lost? A few couple of days? Is that comparable to the 30 year long issues that are part of a wider perspective? It is as they say too little, too late, a world wide economical distrubtion blockade. Today, Tahrir Square, tomorrow who knows? The world has the strange ability to put all the weight of the world in one square. Tahrir Square today is like Atlas. Who put the weight of the world on your shoulders, Tahrir Square?